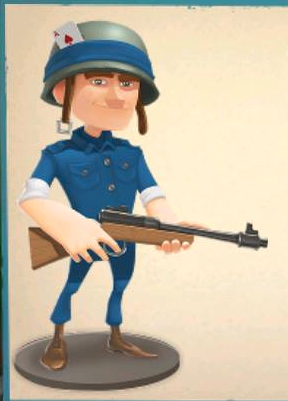 Rifleman : Rifleman is the basic and first level troop. They are powerful to destroy enemy but the life is very short. But you can make them stronger by upgrading your headquarter. You can train your Rifleman within a minute. 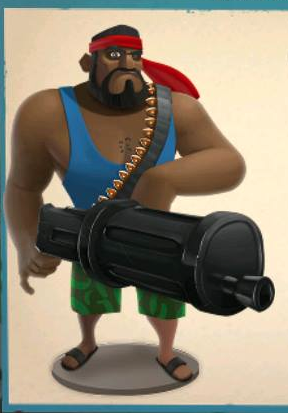 HeavyMan : Heavy is the most famous and long life troop. You can unlock Heavy in Level 2. It takes 6 minutes to train them and cost you 370 to 26,000+ gold to train them. You can improve the health level and attack range by researching Heavy Combat. 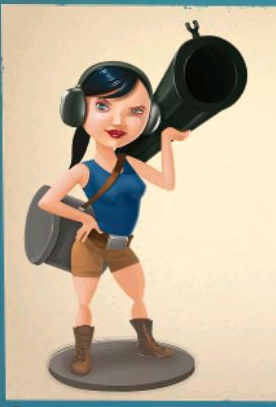 Zooka : Your next Level troop is Lady fighter Zooka. You can unlock them at Level 5. You will be use them as long distance attacks. They always carry heavy weapon and able to do big damage of Enemy. Tank : If you need to destroy your enemy from long distance your your Tank. Great powerful and long heart troop. You can unlock them at Headquarter Level 11. Warrior : Warrior with the heavy hammer. Very strong and awesome troop. They move very fast and you can train them within 6 minutes. Unloack them at Headquarter level 8.